We’ve undergone a name change! What’s the deal? Are we having an identity crisis? The blog is still in its infancy, as is the MSU Special Collections Provenance Project, in many ways. We’re still finding our footing. Beginning in January we’ve got some plans for publicity and outreach, but for now this blog is the only (limited) public face of provenance at MSU. As this year draws to a close, we’re still deciding on a permanent home for the blog, a permanent name, and so on – so bear with us. The content will largely stay the same moving forward, however, so now let’s get to it! 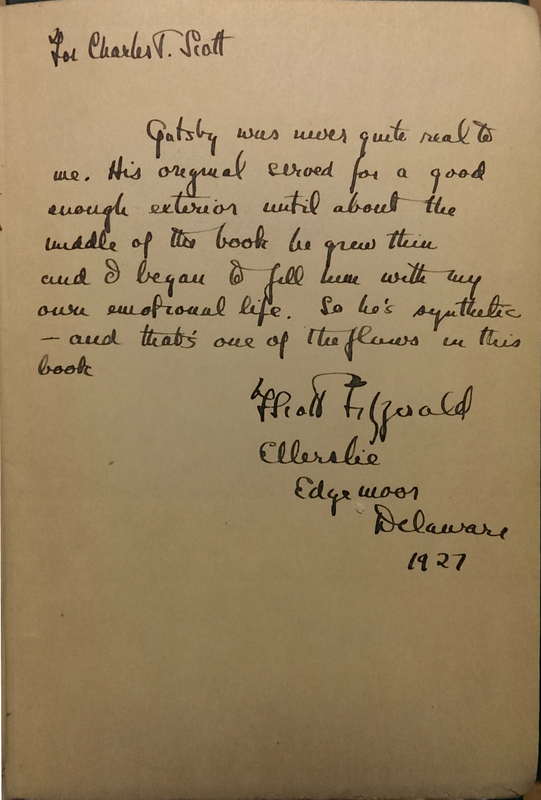 As promised last time, this week I’m highlighting a particularly interesting and timely find in the Special Collections vault: A personalized presentation inscription from F. Scott Fitzgerald, found inside a first edition copy of his book The Great Gatsby. With the release of Baz Luhrmann’s film version of the novel earlier this year, it’s safe to say that The Great Gatsby has been in the public consciousness quite a bit lately, whatever anyone’s particular opinion of the movie may have been. Aside from its potential literary importance, this inscription is also an especially valuable piece of provenance evidence. The start point and the end point for the book’s chain of custody are obvious, of course – the book was published in 1925 and belongs to MSU Special Collections now. The presentation inscription is dated 1927, which means that the author likely had the book in his possession prior to that date, at which point it changed hands to Charles T. Scott, the recipient named in the inscription. But what about the ownership history of the volume in the intervening years? It’s easy to see that this inscription could be very interesting from a literary or scholarly perspective. More than merely an author’s autograph or a personalized dedication (e.g., “To my good friend Charles – enjoy!”), this note gives us new information about the author’s own perspective of a central character in The Great Gatsby — a work still widely read and studied, considered to be one of the great American novels of the 20th century. But how did these authors cite the text of this inscription, an inscription unique to the copy in MSU Special Collections? Might they have viewed the book at MSU, or was the inscription noted in another source, predating the university’s acquistion of the volume? Donaldson fortunately cites a source for his quotation: F. Scott Fitzgerald: A Descriptive Bibliography, by the late Fitzgerald scholar Matthew Joseph Bruccoli. In that work, Bruccoli indicates that an old bookseller catalog was his source for the transcribed inscription. Some additional research returns another, more recent work edited by Bruccoli: F. Scott Fitzgerald in the Marketplace: The Auction and Dealer Catalogues, 1935-2006. This work provides the bookseller’s description of this particular copy, from Goodspeed’s Catalogue #303 in 1938, which lists the book for sale — and for $4.50 no less. First edition dust jackets tell us that The Great Gatsby was originally sold in 1925 for $2.00! Entry in Goodspeed’s Catalogue, from F. Scott Fitzgerald in the Marketplace: The Auction and Dealer Catalogues, 1935-2006, edited by Matthew Joseph Bruccoli. Image from Google Books. This catalog entry gives us another link in the chain: at some point in the 11 years since the book was gifted to Charles Scott it ended up at Goodspeed’s Book Shop in Boston. 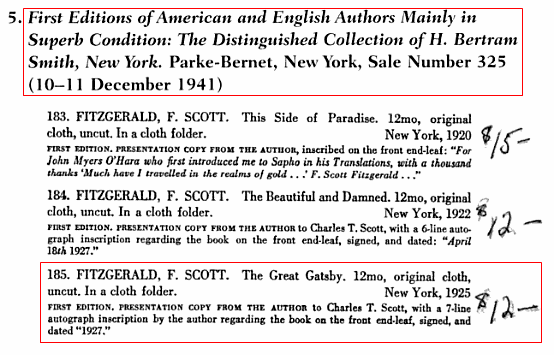 A second entry in F. Scott Fitzgerald in the Marketplace gives another bookseller’s description of the item – appearing in a 1941 sale of the collection of H. Bertram Smith, at the Parke-Bernet auction house in New York (Sale Number 325, 10-11 December). This tells us that at some point in the three years between its listing in Goodspeed’s Catalogue and its listing in the Parke-Bernet sale, the book came into the possession of Mr. Smith, whoever he might have been (note that the price of the book has gone up again). Entry in an auction catalog for the collection of H. Bertram Smith, Parke-Bernet Galleries, New York, 1941. Also found in F. Scott Fitzgerald in the Marketplace. Image from Google Books. But we may be able to fill in more of the links in this volume’s chain of custody. Looking at MSU’s acquisition record for this particular item, we find that the book was donated to MSU Special Collections in 1998 — on May 28th, to be precise. The acquisition record provides us with the previous owner. We’re currently in the process of reconnecting with that donor, and part of that process is to inquire about his (or his family’s) acquisition of the book. I had wanted to hold off on this post until that information had been collected, but I’ll hopefully have an update for you in the coming weeks that fills in more of this book’s ownership history — and the chances are good that with a little more digging we’ll have a complete picture of this volume’s provenance. While it is uncommon to be able to recreate a book’s complete ownership history through a single piece of provenance evidence, in the case of this particular copy of The Great Gatsby, we may very well be able to do just that. Cases like this one show just how crucial and potentially rewarding studying provenance can be.